“A good landscape painter”. Like that, Albrecht Dürer defined his friend Joachim Patinir, a renaissance painter born in now Belgium. Only 5 paintings are signed by today’s artist, however, several more are attributed to him. Patinir painted huge landscapes, with a great deal of detail. These canvas are often fantastic and surreal. The figures or characters in Patinir’s landscapes are very small and, usually, they were painted by other artists, which was an accepted custom in that time. 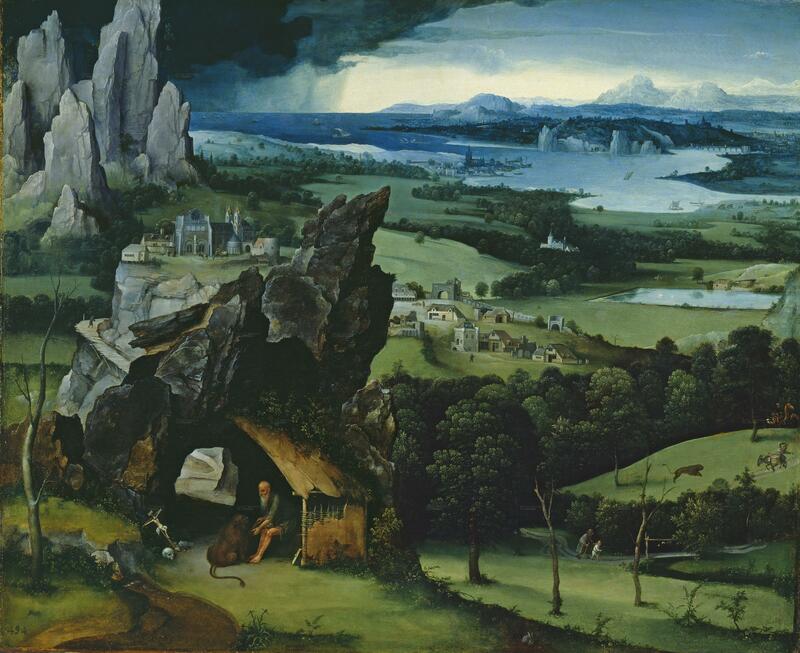 In the canvas Landscape with St. Jerome we see, at the front, some kind of cave where St. Jerome is next to a lion. The legend says that this saint passed by the fierce animal and notices his problems in walking, so he decides to help him. Soon, Jerome realizes that the reason for the limp was that the lion had a thorn nailed in one of his paws. He soon removes it and the lion, thankful for being fixed, offers himself as guardian of the monastery where Jerome lived in. The tale, that was also atributted to St. Gerasmus (obviously by the similarity between the names “Jerome” and “Gerasmus”) continues, but it does not help us with the painting we have today. This story has a deep meaning in the catholic tradition. The thorn nailed is like the crown of thorns Jesus had when he was crucified and it represents sin. Just like Jerome could take the thorn out of the lion, Christ could take sin out from peoples’ soul. Besides the main scene, we can see several secondary situations. Below right, we see an old man walking with a boy. A little upper, we see a lion attacking a peasant on a donkey. This scene, to me, is almost comic: the peasant falling from the donkey, scared, seems pretty hilarious. If we continue looking closely, upper at the left, we see a church in top of a mountain and several roads that lead to it. More on the right, we see some kind of a village and, next to it, a farm with a pond… square. Up in the painting, we see a sea, a port, a bridge and several boats. All these different scenes are put together in the same canvas in a bizarre, almost delirious way. Or, moreso, surreal. A square pond, a castle emerging from the deep of the forest, weird rock formations and tiny characters convince us that it is a fantastic vision of reality that maybe Patinir was looking at. Or not. However, this collection of unconnected situations makes the painting interesting. You have to look at every detail and keep looking the work in parts, because it is impossible to see it as a whole. It doesn’t seem to have any logic. ~ by Álvaro Mazzino on August 2, 2010.
is a really well written article. I’ll be sure to bookmark it and come back to read more of your useful info. Thanks for the post. I will certainly return. Would enjoy perpetually get updated great site! You’ve gotten remarked very interesting points! ps nice site. Inform them of new discounts and locations that are taking place. time ‘ bringing in a PR agency or employing lots of automation tools just defeats this and turns Twitter into an extension with the website, publication or public profile of the individual or brand concerned. success from the champions hailing from your Sityodtong Payakaroon Camp comes down to teaching refined basics. on your site then immediately I got a terrible suspicion I had not thanked the blog owner for those strategies. really needing to learn about. My very own sincere regret for not expressing appreciation to sooner. This entry was posted on August 2, 2010 at 13:50 and is filed under Renaissance.You can follow any responses to this entry through the RSS 2.0 feed.You can leave a response, or trackback from your own site.